The purpose of this document is to detail the installation and configuration of an Uplogix Local Managers (LM) to facilitate remote connectivity to a KG Encryptor. Connect a free serial port on the Uplogix to the KG-175A’s RS-232 console management port with a standard Cat-5 cable and a RJ45-to-DB9 connector. Connect the Uplogix LM’s corresponding Ethernet port to the KG-175D’s front-panel-mounted Ethernet Port provided for the Console with a standard Cat-5 cable. A dedicated Ethernet connection is required for Ethernet port forwarding. This type of connection is supported on an Uplogix 5000 with an installed dedicated Ethernet card. The default console settings for the KG-175A are 9600 bit rate, 8 serial data bit, no serial parity, serial stop bit 1, no flow control. Each dedicated port IP address assignment must be on a different network. The device IP assignment and port IP assignment should be on the same network for this port. To configure the Local Manager to pass web traffic to the KG-175A’s web interface, run the config protocol forward command as below and enter dedicated 80 http to set the TCP port to which traffic will be passed on the device’s dedicated IP address (172.16.0.1, entered above). To connect to the serial console of the KG-175A, first connect to the Uplogix LM using SSH, navigate to the port that the KG-175A is connected to, and use the terminal command. When finished, use ~ to disconnect. 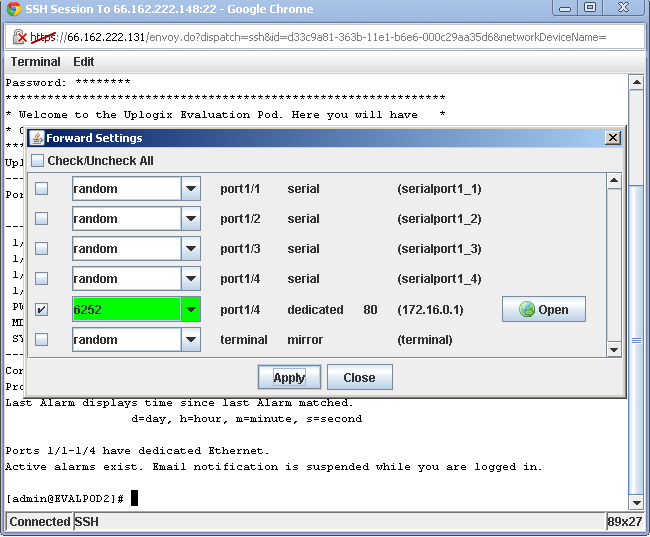 The methodology for connecting to the web interface of a KG-175D varies slightly depending on the SSH client being used. To use the SSH applet in the Uplogix Control Center’s GUI, click the CLI button for the Uplogix LM, log in with valid credentials, click Terminal > Forward, click the check box next to the KG-175D’s port, then click Apply. A connection to the KG-175D’s web interface can now be achieved by opening a web browser on your workstation and entering 127.0.0.1:[port] in the address bar, where [port] is the port highlighted in green (6252 in the above example). The port is selected randomly when Apply is pressed, but can also be set manually by entering a port number and pressing Apply.